War memorials in the UK and India have been twinned to remember Indian workers who died in World War One. The High Commissioner of India laid a wreath of marigolds at the Arch of Remembrance in Leicester. Meanwhile, the British High Commissioner did the same at a ceremony at the India Gate in New Delhi. Hundreds of people attended the events in memory of the 1,174 Indian Labour Corps men who supplied the army with weapons, food and built barracks. The commemorative events were part of The Unremembered project to honour the courage and sacrifice of labourers in World War One. In Leicester, about 300 school children and dignitaries including the city and Lord mayors held up the names of the men and tied messages to the fallen during the ceremony. Teacher Mrs Hobson, of Moat Community College, said: "This event is important because it's about our shared heritage... and it allows us to link our students to their Indian heritage." Squadron Leader Rana Chhina said Indians in Leicester "should be proud" of the connection because it "helps strengthen the bond" between the UK and India. British architect Sir Edwin Lutyens designed both war memorials in the 1920s. 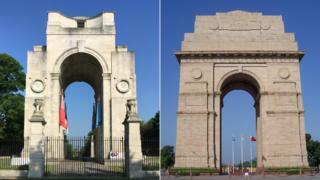 The workers' names are engraved on the India Gate, which was built in 1931 and took about 10 years to complete. Work began on the Arch of Remembrance, in Victoria Park, which is half the size of the gate, in 1923 and was finished in 1925. In 2015, all 44 of Sir Edwin's World War One memorials in England became listed by Historic England.